Now that it’s almost December it’s time to break out all the holiday-themed activities. This one is super simple but lots of fun: candy cane counting from Mom Inspired Life. 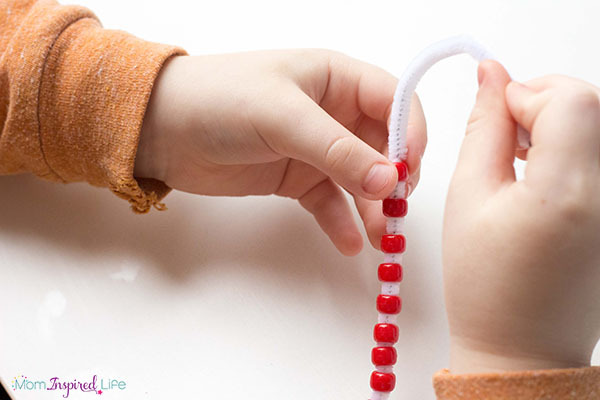 All you need is pipe cleaners and beads, and kids can count, make patterns, turn the designs into candy canes and more. Stringing beads on pipe cleaners is a great fine motor activity, and you might as well make some beaded holiday ornaments while you’re at it, am I right? It’s great for preschoolers and others working on counting and making patterns, and you might even already have everything you need to do it.